Almond Trees belong to the same family to which roses, plums, peaches and apples belong. Mainly cultivated for their edible nuts, Almond Trees are also planted for their beautiful looks when they have flowers. It is a medium sized tree that hardly grows taller than 25 feet. It is deciduous and possesses 3-5 inch long dark green leaves. The leaves usually have serrated edges. The white and pink blossoms are aromatic and they appear in early spring. The nuts look like unripe peaches, but they are actually drupes. The almond within these nuts is harvested when the external hard covering is split after eight months on the trees. Almond Tree is native to Mediterranean climate of Middle East Asia such as Pakistan, Syria and Turkey. However, it is now cultivated in temperate climate around the world. A type of Almond Tree that grows bitter almonds (known as wild almond) grows in the Mediterranean. Almond Tree is planted in winter when the flower buds are dormant. Upon planting, the tree develops its root system. The plant shows a healthy growth in sunny atmosphere. It can tolerate most of the soil types, but deep, fertile and ample water supply (or water holding capacity of the soil) is the best conditions for it. 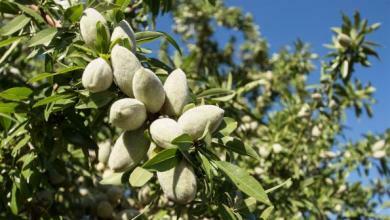 If the tree’s flowering session coincides with a temporary frost or rain weather, almond harvesting is seriously affected. Amount of almonds collected reduces drastically. The native bitter almonds contain a toxic called amygladin. So bitter almonds should not be eaten in large amounts. Almond Tree having pink flowers produce sweet almonds and those having white flowers produce bitter almonds. Peel of the almond is the most nutritious part. It is a rich source of healthy oil, protein and rare plant bio chemicals (phytochemicals) such as catechitin and flavonoids. For better absorption of these nutrients, almonds should be chewed properly. The flavonoids act as antioxidants that help in reducing the plaque inside the arteries. The heart doesn’t have to apply more pressure to propel the same amount of blood, so its beneficial for the heart too.